Out of two farms in Arsten and Habenhausen, one of Bremen’s most populated neighbourhoods has developed: Overvieland. Left of the Weser, you’ll find modern, high-rise developments located directly inside recreational areas, and sections characterized by detached single-family homes as well as row houses. Every year, the residents hold the neighbourhood festival "Obervielander Vielfalt" in a different section of the neighbourhood. Quelle: Bürgerhaus Gemeinschaftszentrum Obervieland e.V. The "Erdbeerbrücke" (Strawberry Bridge) officially known as the Karl-Carstens-Brücke, connects the neighbourhood section of Habenhausen with Bremen’s city core. The bridge’s fruity name recalls the strawberry fields of the formerly rural Habenhausen. The original village centre has been extended by new developments, creating an area consisting mostly of single family houses with gardens. 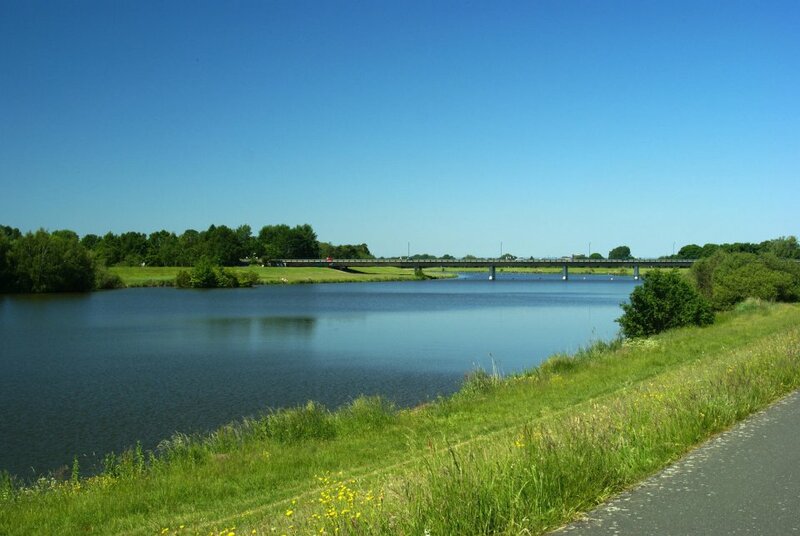 The Habenhauser Deich, which runs along the Weser River together with the adjacent nature reserve, "Neue Weser", provides plenty of space for recreation activities and relaxation. The old Kirchdorf Arsten (church village Arsten) also makes a rural impression. Even today quaint streets surround the St. Johannes-Kirche (St. John’s Church). As one of the areas in Bremen with recent residential development, Arsten may still allow you the dream of owning your own home, surrounding by nature, with an organic farm shop on the doorstep. Kattenturm has kept less of its rural origins. In the 1960s, an area of high-rise residential flats was built as well as the hospital Klinikum Links der Weser (Medical Centre Left of the Weser). The core of Overvieland is centred around the pedestrian zone on Gorsemannstraße, where the town hall is located. Kattenturm shares the Kattenescher Fleet, and its bicycle paths, hiking trails, the Ochtumwiesen, and the Wadeackersee, with the Kattenesch section. A good choice for city lovers, who like their peace and quiet, as well as a bit of nature, to call home. The unofficial spot for swimming in the Weser River in Obervieland is Uferaue Habenhausen (Habenhausen Meadow Banks). Even though there are no lifeguards or sanitary facilities, the natural beauty of the area shines through. For the young people of the neighbourhood, there are a wide-range of activities on offer at the Bürgerhaus Gemeinschaftszentrum Obervieland (Community Centre Obervieland): games, sport, dance, music, disco nights and concerts, computer clubs, and creative groups. Various club rooms and a rehearsal space which can be utilized. Even though the former "Werderbrücke" was re-named in 1999 as the Karl-Carstens-Brücke, it is still mostly known by a third name: Erdbeerbrück (Strawberry Bridge). The fruity name recalls the large strawberry fields that were once found in Habenhausen. The bridge connects the neighbourhoods of Habenhausen and Hastedt. In 1987, the sculpture alley was established with the artistic work of juvenile and adult convicts. The sculptures of sandstone, which including some life-sized figures, were realised under the supervision of Peter Miczek and Jürgen Cominotto. They are located on the Alfred-Faust-Straße at the corner of Gorsemannstraße. The Habenhauser Deich (Habenhauser Dike) combines flood protection with recreational activities. The dike system invites you to bike, skate, and stroll along its considerable length. Its green hillsides reach to the Werdersee, and are an ideal place for a picnic in the summer months. 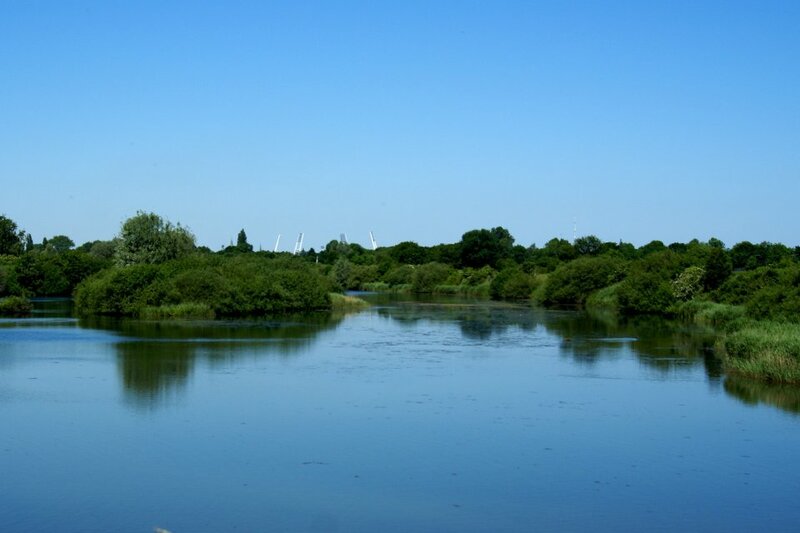 In Wolfskuhlenpark, you’ll find hiking trails and waterways within three hectares of land. It gets its name from a legend: A long time ago, a carriage was supposedly chased by wolves and fell into a pond. As a reminder of this tale, dozens of wolf prints can be spotted throughout the park. But don’t worry, the paws are made of steel - produced by the Bremen artist, Werner Henkel. Nature Reserve Area "Neue Weser"
The nature reserve area with bird sanctuary "Neue Weser" stretches out between the Weserwehr and the "Erdbeerbrücke" (Strawberry Bridge). The Wehrstraße and the Winterweg, at the garden allotments, provide particularly good views of the river. You can find information boards and observation platforms here. A real insider tip for summertime swimming fun in the Weser is the floodplain on the river bank in Habenhausen, the Habenhauser Weserufer. The re-natured area serves as an unofficial bathing area, without lifeguards or sanitary facilities. 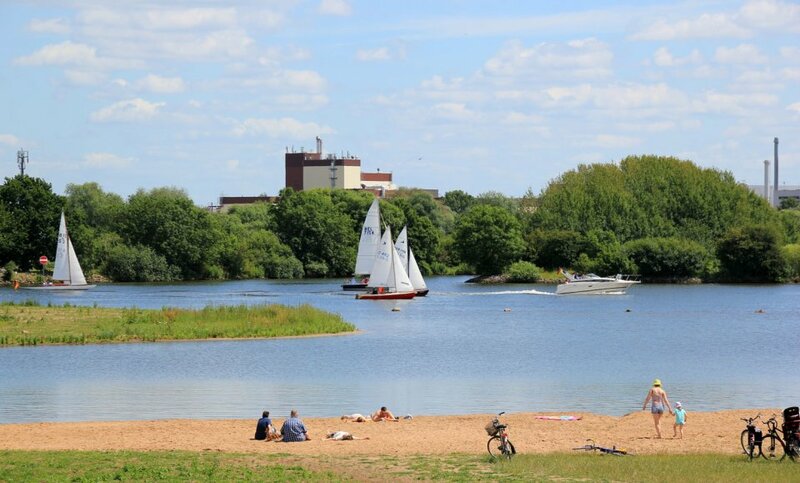 The natural design of riverbank has made it one of the most popular places to swim in the river. 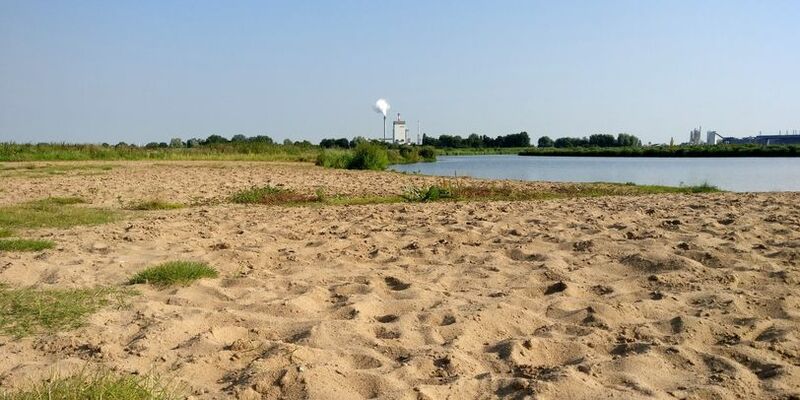 Der Sandstrand an der renaturierten Uferaue in Habenhausen ist ein Geheimtipp für Erholungsuchende.